SANTA CLARA, California. 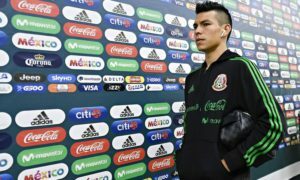 In the Copa America quarterfinals, Mexico and Juan Carlos Osorio thought that they had an idea of what they were coming up against when they faced La Roja. But from the opening whistle, Chile outclassed Mexico in every way, getting a poker from Eduardo Vargas as they throttled Mexico 7-0. 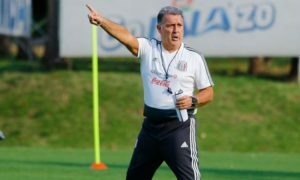 Juan Carlos Osorio tinkered again with the side and left Rafael Marquez on the bench, and started Jesus Duenas in the attacking midfield. The decision left Mexico without an obvious protector to deal with Chile’s pressing and recover the ball in favorable situations for Mexico. And right from the opening whistle, La Roja imposed terror in theirs on El Tri with their pressure, passing, and movement. Tom Harrison goes into a much deeper tactical discussion of this. Fifteen minutes into the match, La Roja opened the scoring as Edson Puch slotted a spilled rebound by Guillermo Ochoa. Alexis Sanchez beat two Mexico defenders who had trapped him on the wing with a sombrero cross that was worked back to Marcelo Diaz for the initial shot that was saved by ‘Memo’. Ochoa spilled the rebound right to Puch who finished the play. After the first goal, Mexico tried to win possession, but Chile was able to continue to not only take the ball from Mexico attackers, but break down their defensive structure. And one minute from half time, Eduardo Vargas doubled La Roja‘s advantage as he finished off a cross by Alexis Sanchez. Sanchez had lulled two Mexican defenders on the right into a standstill before hitting the cross. Nestor Araujo initially intercepted the cross, but he deflected it instead to Vargas who fired a left-footed shot past Ochoa. Right before Chile grabbed their second goal, Mexico was able to work some moments of possession, but attackers like ‘Chucky’ Lozano and Andres Guardado were often too tentative and had the ball taken away by the time they started to make a decision close to Claudio Bravo’s goal. The deficit started almost as soon as the second half began. Alexis Sanchez grabbed a goal of his own in the 48th minute to take Chile’s lead to 3-0 after Arturo Vidal dribbled past three defenders to set up the unmarked Arsenal striker. Three minutes later, Vargas bagged his second off of a failed offsides trap as Chile took the lead to 4-0. Eduardo Vargas completed his hat-trick in the 58th minute to take Chile’s lead to 5-0. Vargas finished off a play that started with a throughball through a big interior gap from Alexis Sanchez to Jean Beausejour with enough space to find Vargas. All the Hoffenheim striker did was place the strike past Ochoa (rebound as well). Chile then ceded more of the ball more, but Mexico could not create anything from it to break Chile’s defense down. And eventually, in the 72nd minute, Vargas completes his poker on a sharp angle shot. Vargas initially recovered a failed clearance by Hector Moreno and then fired the sharp-angle shot by an inattentive Ochoa. One minute from the end of the ninety, Edson Puch finished off a Chile counterattack to complete what ended up being Mexico’s worst-ever defeat in a competitive match. After Alexis Sanchez initially made a long run down the left, he dismarked two Mexican defenders with a pass to Arturo Vidal who then found Puch who then dribbled the ball past another defender and slotted home Chile’s final goal. 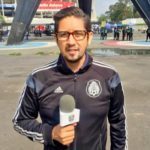 While many will be calling for Juan Carlos Osorio’s head as Mexico manager due to his poor selection to start the match and constant experimentation, this should be a reality check as to what is missing among Mexican futbolistas–the street ethic to impose one’s will on the match and the unwillingness to pass and move at speed against a hard-kicking, scrappy, technical, tactical side that has clearly proven that it is at (or almost) at the global standard for futbol, as well as a sheer ruthlessness to finish the opponent to make a statement. These are things that would not be had in molero victories over the same opponents in the United States to a not-very-demanding crowd (relative to the standard in Mexico or even South America). In addition, the SieteACero is the worst defeat Mexico has ever suffered in the United States. 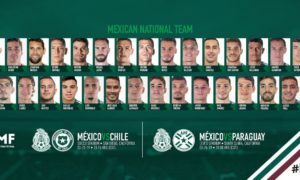 Mexico will take a lot of lessons from this tournament as it prepares to complete its World Cup qualifiers in the fall. For now, the directors at FMF, as well as the fans, players, and technical staff have to take a hard look at what really happened and how more than just the national team will need to build going forward to stay afloat in a changing world of futbol.